The estate of notorious Nazi propaganda minister Joseph Goebbels won a lawsuit against Random House publishing company in Munich last week. 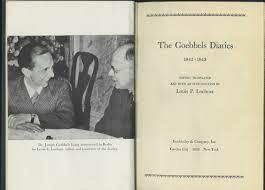 The case was brought against Random House Germany by the estate because royalties were not paid out for the use of Goebbels’ personal diaries in a 2010 biography written by historian Peter Longerich. The biography was originally written in German and was republished in English by Penguin Random House UK and its imprint Bodley Head. The Newsweek Report may be found here. Versions in the Israel press are slightly different. This is far from the first copyright argument related to Goebbels’ diaries. When they were first discovered in the early Nineties, different British papers published extracts. I believe the Mirror Group paid royalties but the Sunday Times refused to. Substantively, Random House showed creativity in suggesting that the royalties be paid to Holocaust Survivors. I can understand why Nazis sympathizers may find the suggestion inappropriate. I suspect that the same considerations that caused Menachem Begin to oppose German reparations to the State of Israel might make more than once survivor feel uncomfortable with the idea as well. I think that Random House’s arguments that the copyright was removed along with other possessions after the War is an interesting one. Jewish courts can also appropriate private property in the principle known as הפקר בית דין הפקר. That as may be, if the German court did not accept the argument and the State of Barvaria has shown no interest in contesting their rights, the legitimate heirs of Goebbels are entitled to seek retribution. Unlike Goebbels, I believe that IP and other property rights have to be recognized regardless of the political leanings, race and nationality of the owners. Random House’s arguments regarding scholarly access, etc. have more than a little merit. This is one reason that I am against the present long copyright periods, and think that copyright should be for, say, 10 years, extendable on payment of a fee, for a second ten year period. This is also probably why rather than writing books I write a blog and am happy for anyone to reproduce or quote, so long as they attribute.